App makers come up with ideas and make them a reality. They design, code and create entertaining experiences from nothing. But most importantly, app makers are exceptional individuals with different backgrounds, interests and dreams. To celebrate their hard work, creativity and entrepreneurial spirit, starting this week we’ll feature founders, product managers, designers and developers from the Android community around the world. We’ll showcase their passions and also hear about what they do when they step away from their computers. But before we get started—are you an app or game maker? If so, we want to hear from you. Post on your social channels using #IMakeApps, sharing the app or game you work on, your role in its creation, and an image that best depicts who you are outside of work. We’ll be picking and sharing some of our favorites on our channels. 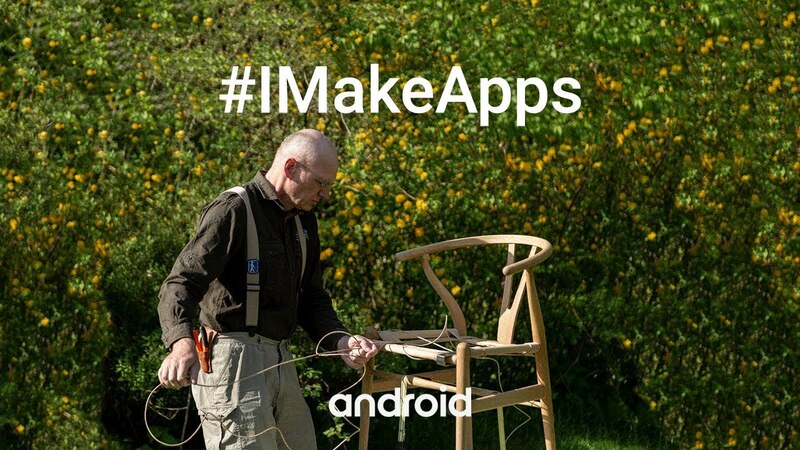 And stay tuned for more #IMakeApps stories on g.co/play/imakeapps. To kick things off, we’ll hear from our first app maker: Hans Jørgen Wiberg, a visually impaired chair restorer from Denmark and co-founder and inventor of Be My Eyes. At 25 I was diagnosed with an eye disease, so I gave up my plans to take over my family’s farm. Instead, I studied for a degree in philosophy and went on to restore chairs. So I’m not a techie and never thought I’d become one. I then came up with the idea for Be My Eyes in 2012 and that was the beginning of my tech journey as more than a smartphone user. How did you come up with the idea for the app? I am going blind myself and was also working for the Danish blind association as a consultant. Some of my blind friends were reaching out to friends and family via video calling services to ask for visual assistance but they always had to decide exactly who to call—this sparked the idea of Be My Eyes and a community of volunteers who could step in. How did you kick off the project? I took the idea to an event looking for support to turn it into a reality. I was lucky enough to be able to form a team of interested people; they have been working with me on this project ever since. The first year we spent raising the money, which allowed me to start hiring professional coders to build the app. What has been your experience with Android & Google Play? Since we launched our Android version in October 2017 we have had some very interesting numbers in places like Brazil and India and we consider Android a key factor in our goal of reaching the 90 percent of blind people living in low income settings. It was also great to win the Google Play Award to the best accessibility app earlier this year. Be My Eyes is my only app. It has grown enormously since launch and it seems to be picking up speed over the last few months where we have increased +20%. Our network of over 1 million sighted volunteers now help visually impaired people in over 150 countries and over 180 languages.